JIC Exhaust - Spartan 505S Ti - Dezod Motorsports Inc - Home of the automotive performance enthusiast since 2002. The JIC Spartan 505S Ti features our most popular style. An aggressive canister and smooth piping aid into giving your vehicle performance, a great exhaust tone, and weight savings. Each Spartan DE Type 1 Ti features a 60mm piping for smaller engines or naturally aspirated engines or a larger, full 80mm piping for larger displacement engines and turbo applications. As a unique trait to Titanium, the exhaust piping walls are a mere 1mm thick which help the exhaust tempratures disapate faster allowing cooling times to decrease. 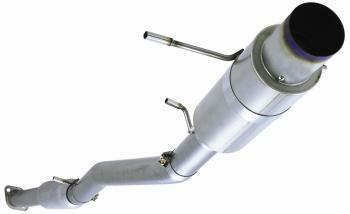 All Spartan exhaust systems include an inner silencer. As a unique design only to the Spartan Series, the canister has either a bolt on flange or a slip in type depending on vehicle application. Certain Spartan 505S applications also has a resonated option to keep the exhaust noise down. Spartan 505S exhaust systems comes with either an angled exit or straight exit canister. JIC is the originator of the full Titanium exhaust system.